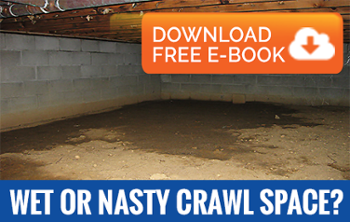 Determine how the moisture gets into your crawlspace. I may be that the uncovered earthen floor is damp and evaporates water into the crawlspace and increase the humidity in the crawlspace. Roof leaks, gutter issues, poor drainage away from the structure, broken pipes, leaking shower and tub drains, and plugged HVAC condensate drains are common problems. Once source(s) of crawlspace moisture are identified our AdvantaClean of the Triad experts can recommend and assist with those solutions. It is important to assess the damage caused by the excess crawlspace moisture. Insect damage - insects like termites are drawn to moist conditions and wood. Cleaning up the mold, repairing the structural damage, treating for insects are the next step and AdvantaClean of the Triad can assist you all the way. Caring from crawlspace: Once everything is dealt with and repaired a good crawlspace dehumidification system should be installed to maintain poor humidity levels in the crawlspace.